At The National, we proudly serve Rishi Tea, a high-caliber tea producer out of Milwaukee, Wisconsin, that offers the highest quality organic and Fair Trade Certified loose leaf teas, fresh each season and direct from tea gardens around the world. Their employees travel thousands of miles each year to work hands-on with skilled artisans whose families have been making traditional teas and herbs for generations. They utilize these direct relationships to produce rare and exclusive teas that offer an unmatched level of freshness with an ensured level of quality and authenticity. On a chilly morning this week, we sat down with Bobby from Rishi Tea to taste and to learn a little more about their teas to better serve you. Lesson One: “Tea” is only tea if it comes from the plant camelia sinensis. Differences in flavor are due to differences in region of origin, farming conditions and processing methods, as well as the utilization of blends. The popular Earl Gray has a recognizable malty taste derived from a blend with Bergamot oil. Our Moroccan Mint is a blend of a green tea and mint, an ideal choice for someone looking for a lower caffeine content combined with a soothing minty freshness. Genmaicha is steamed then blended with puffed rice, a depression-area trick that stuck. Lesson Two: Herbal “teas” are just herbs. They are always caffeine free because they are not derived from the tea plant. Rooibos is a South African bush of which the leaves are used to brew. Chamomile is a flower and Peppermint is the same as the herb you might cook with. Lesson Three: The designation between green, white, oolong, black and dark teas is all in the post-processing. White tea is harvested from the plant and left to air-dry immediately. It is derived from the youngest buds and is the least processed, resulting in a smooth and fresh taste. Green tea is heated immediately upon harvest through steaming or roasting, resulting is a nice roasted flavor and a fresh/vegetal taste. This method prevents oxidation and retains the green color. Oolong teas fall between black and white teas, resulting in a balance of floral and roasted notes with a pleasant bitterness in the finish. The leaves used in Rishi’s Eastern Beauty Oolong tea have been nibbled by bugs when still on the leaves, beginning the oxidation process early. Black teas, such as Golden Assam and Ceylon, are rolled intensively, then allowed to rest and oxidize for 8 hours or so, depending on the tea. The intensive rolling and extended time to rest is what darkens them, achieving full oxidation. This is the most commonly recognized flavor of tea. The final tea designation, and perhaps the least well-known in the U.S. is Dark Tea, or Pu-erh. This tea has a earthy taste profile developed through a fermentation or long-term aging with beneficial bacteria. 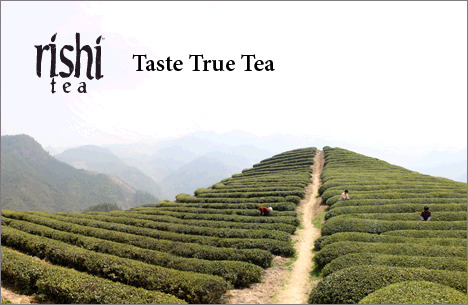 Rishi has developed certified conditions to develop this tea, and uses no vintages older than 2004. Some say dark tea is good for digestion. Lapsang Tea is a smoked tea. Lesson Four: It is a myth that white tea has the least caffeine. It actually has slightly more than green or black teas. However, the real lesson is that all teas have essentially the same caffeine level, roughly half to one-third the amount as coffee. Choosing a blend is a good method of lessening the caffeine content in your tea, or just drinking herbal. Lesson Five: There are some rules of thumb for steeping time and water heat, but always read the box for the producer’s recommendations. For Rishi teas, green and white teas should only be steeped for 2-3 minutes. Green tea should be brewed with 180 degree water, and white tea at 180-185 degrees. It is important to drink green tea while hot because as it cools the flavors separate. White tea is drinkable as cooler temperatures. Black and dark teas should be steeped for 4-5 minutes.